Fresh rolls with BBQ pork meatballs are the perfect balance of spicy, salty, sweet and sour. You won’t believe how easy they are to make at home! If you’ve never made fresh rolls at home, I urge you to give it a try. They might look intimidating but they are actually quite easy and many versions are completely no-cook thanks for pre-cooked shrimp and lots of fresh veggies. As I’ve mentioned many times, my family grew up eating Vietnamese food at Mr. Lee’s restaurant here in West Michigan. Sadly, Mr. Lee closed up shop many moons ago but I will forever be grateful for the fresh roll platter appetizer that allowed us to roll our own fresh rolls at the table. Don’t get me wrong, I love the pre-rolled versions served at many Asian restaurants but there is something really fun about dipping that rice paper wrapper into the warm water and filling the roll with your favorite meats, seafood, vegetables, noodles and herbs. Fresh rolls with BBQ pork meatballs are the perfect balance of spicy, salty, sweet and sour. You won't believe how easy they are to make! In a large bowl, mix together pork meatballs (ground pork through pepper) and shape into evenly sized small meatballs. Heat grill or broiler on high heat and cook meatballs about 4 minutes per side or until nicely browned; remove from heat and set aside. Boil 8 cups of water and keep warm. Whisk together dipping sauce in a small bowl and set aside. 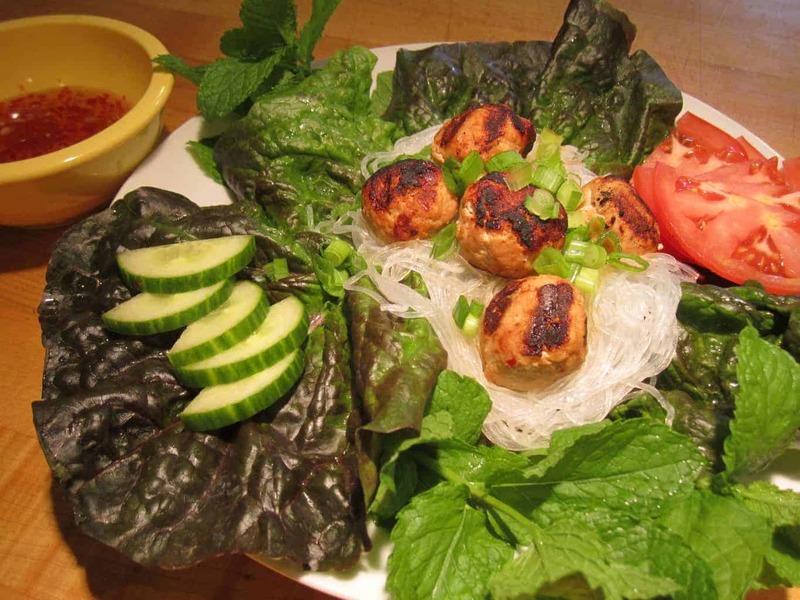 Place vermicelli noodles in a glass bowl and cover with boiling water. Let sit for 5 minutes then drain with cool water; set aside. 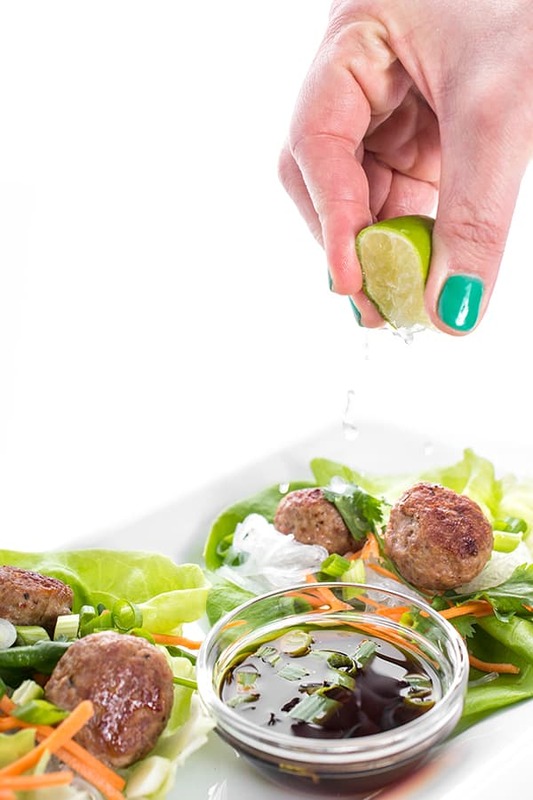 Begin creating an assembly line with the noodles, lettuce, cucumber slices, shredded carrots, halved meatballs and fresh herbs. To soften the rice paper, fill a shallow pie plate or cake pan with boiling water. Add one rice paper at a time and soak for 5 seconds then move to a plate to fill and roll. 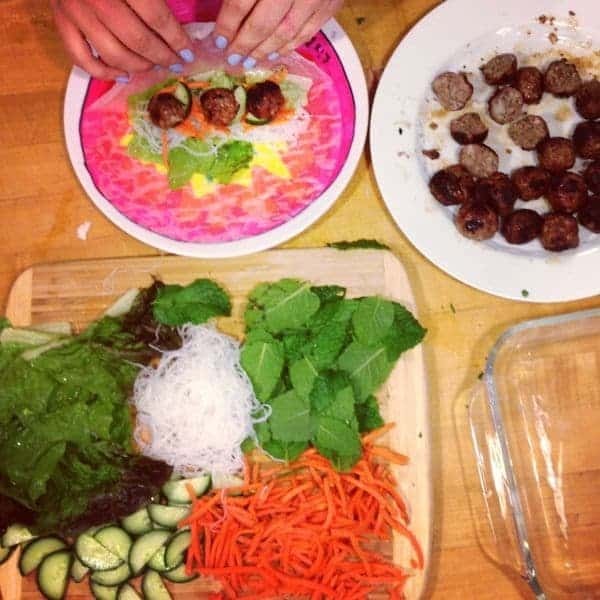 Working from the center of the roll, place a lettuce leaf and top with fresh herbs, noodles, carrots, cucumber add three meatball halves. Fold in the sides then bring bottom over the filling and tuck while rolling tightly. Place on a platter and continue rolling remaining 11 sheets. These look wonderful. Can you tell me where to find rice paper? 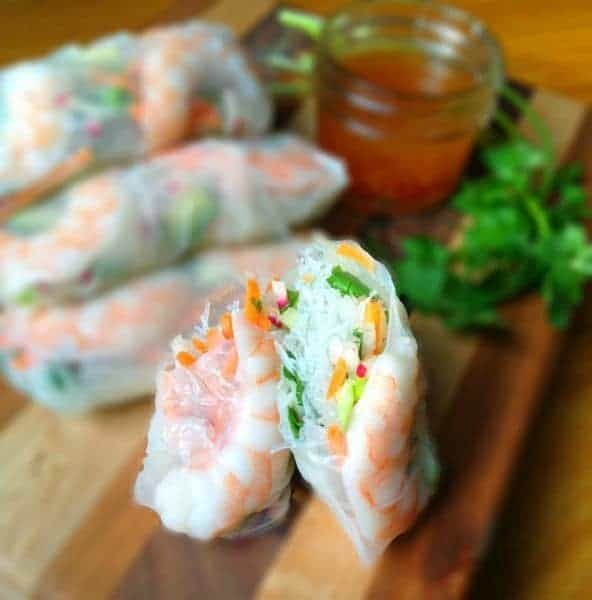 You can purchase rice paper at any Asian grocery store, most major grocery stores in the Asian section or on Amazon.com using the link provided in the recipe (also by clicking here) Let me know if you find them!! Vietnamese sandwich for example, they’re really easy and delicious. Yum! I have much more experience with lumpia (Filipino egg rolls) but I love fresh spring rolls too. I am loving the addition of the BBQ pork meatballs in this version. Looks delicious! Ooo lumpia sounds so good!! Do you have a recipe? 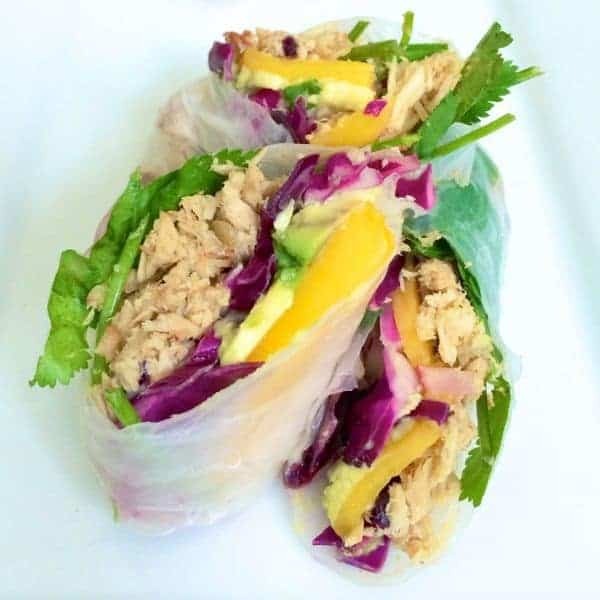 You know I’m such a sucker for spring rolls and this one is no exception! Love the meatball twist in this! You would love these Chung-Ah!!! I love absolutely everything about this recipe! Cannot wait to make these … yum! 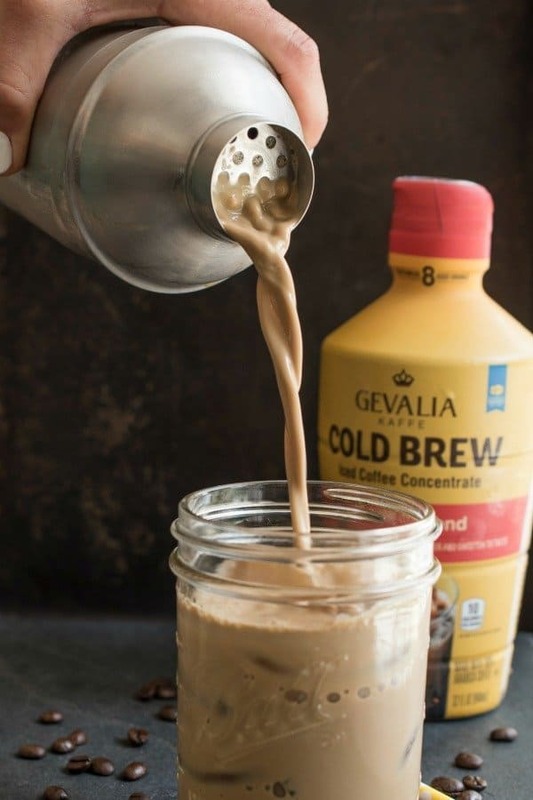 Thanks Kelly – the flavor is so fresh and addictive!! You’d love them! I think Mr Lee was onto something with the idea of rolling your own at the table. That’s brilliant (and the early experience helped shape the cook you are today). I think so too! Wish I had some right now. Caught these on Instagram and have been totally drooling over them ever since! 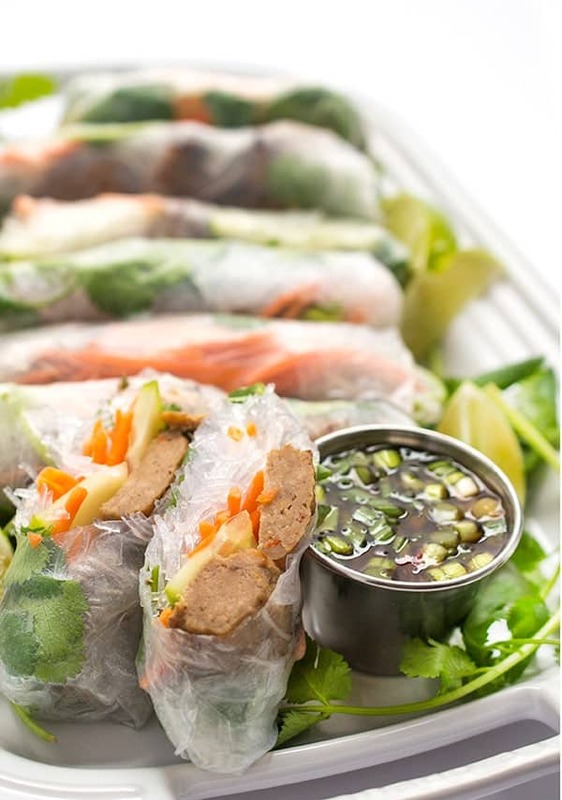 I adore fresh spring rolls (just had some at lunch today actually–no lie), and now I’m feeling motivated to give them a go for this weekend’s game watch. I was planning to make meatballs anyway, so this will be an upgrade! I love that you ate them yesterday!!! I hope you enjoy making them!! Amazing flavors!! I need to make these soon! I am feeling some major food blogger envy right now–I can never roll spring rolls like that! The veggies always poke through the rice wrapper or the rolls are fat and pudgy or defective in some other way. ;) These are gorgeous! I have never made anything like this at home but it looks so tasty. I have had a craving for Asian food most of my pregnancy so far so this is up my alley! I have been eating so much Asian food this pregnancy too!!!! What is it?! Holy yumminess!! I’ve been wanting to try and make my own rolls forever! Please try making them – you will die when you see how easy they are to make!! LOVE fresh spring rolls!! And how cool is it that you used to be able to roll them at the table?! These look so fresh and tasty, and now I totally want to try them with BBQ meatballs! I love everything about these. That sauce has me drooling this morning. I never make fresh rolls or dumplings at home because they seem like so much work. I’ll take your word for it that these are simple to do! Yum, I like vegetable rolls! I’ve always wanted to try but was intimidated. You make it look easy. Pinning! Let me know if you try them!! Easier than you think!! YUM! I want this for breakfast. Really. 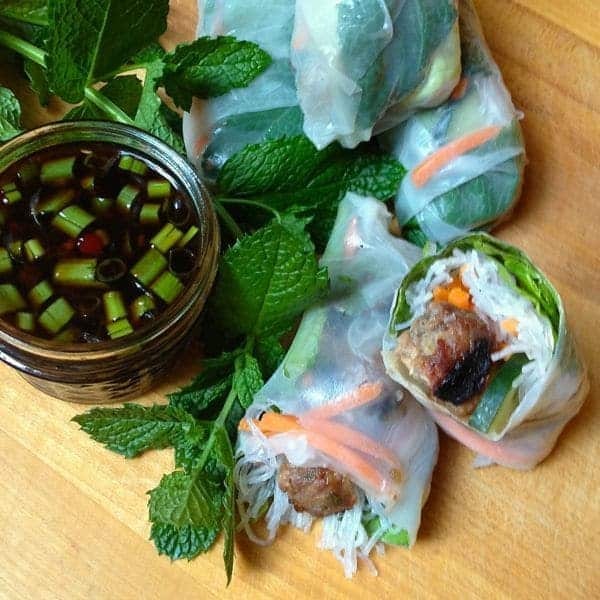 I love making spring rolls and the flavors of these sound awesome!